The Quest System consists of a series of W-beam fender panels supported by diaphragms and features an integrated front trigger mechanism. The system is NCHRP 350 TL-2 and TL-3 compliant as a redirective, non-gating crash cushion. The Quest can be used to shield fixed objects of 24” to 36” wide and offers bidirectional protection. 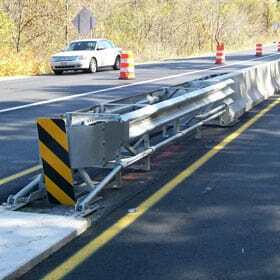 The system arrives fully assembled and is available with a number of connection panel options for guardrail and concrete barriers. It is also available with a free-standing backup. The open frame design facilitates quick and easy inspection and maintenance.